Attributions and conjectures: Photographed by P.A. Portelance, Farnham and Granby, Quebec. 1 photograph: b&w; 9.75 x 15 cm. This item consists of a portrait of Elder and Mrs. Skinner (Mrs. G.H. Skinner?) along with three children: Laurence, 11 years 3 months; Irwin, 8 yrs., 9 months; and Lori, 5 years, 9 months. 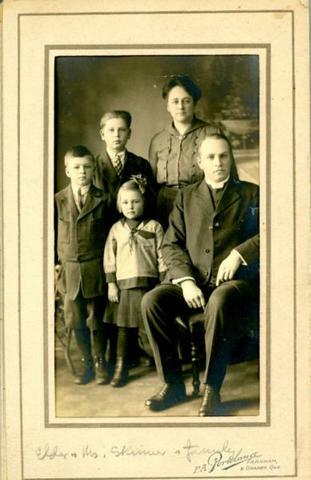 It appears to be the same family as the family in the first photograph (P01). The photograph was taken in St. Johns, NB.